high-speed wired and wireless internet access. and H2 Kitchen & Bar. and all of the other myriad attractions of Los Angeles and Southern California. Located in the middle of the most revered neighborhood in Los Angeles, Loews Hollywood Hotel knows a little something about treating guests like celebrities. At the annual Academy Awards, the hotel’s Hollywood Ballroom serves as the press room for all Oscar winners, who moments before were accepting their awards on the Dolby Theatre stage. 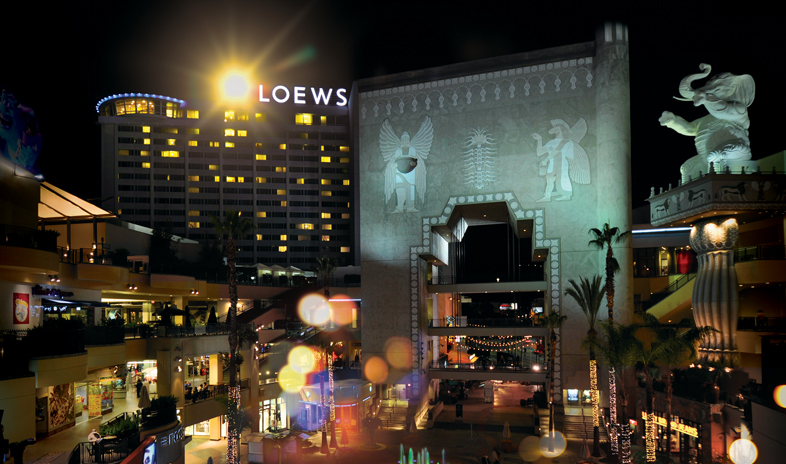 The Dolby Theatre and Loews Hollywood are the centerpieces of Hollywood & Highland, where guests have direct access to premier shopping, dining, and entertainment venues. The complex’s largest venue, the Ray Dolby Ballroom, spans 25,090 square feet. It divides into six salons or dazzles groups of up to 2,000 attendees in its largest configuration. Equally impressive and flexible, the Hollywood Ballroom holds up to 650, while the Canyon Rooms hold up to 400 guests. The Community Rooms often serve for breakouts or groups of up to 100 participants. Other events at the hotel range from executive summits in the Panorama Suite, with breathtaking, 270-degree views of Los Angeles, to cocktail soirees around the rooftop pool and banquets catered by Loews Hollywood’s expert culinary team and Wolfgang Puck Catering. Everything — including the meeting rooms, 628 accommodations, fitness center, Bodega grab-and-go, Preston’s restaurant, and H2 Kitchen & Bar — lies steps from the TCL Chinese Theatre and Hollywood Walk of Fame. Guests can reach Universal Studios and downtown Los Angeles via the Metro, which stops right under the complex. Or they can relax in the lobby and watch — discreetly, of course — who comes in next. Great Hollywood Location! This hotel is being renovated, which was needed, and I look forward to seeing it post reno. Fun history in this hotel. Stellar view. Conference Services staff was so accommodating. F&B, exceptional. Everyone on the team outdid themselves and we were extremely grateful for their help in making our event a tremendous success. Thank you as always for providing us with a wonderful hotel experience as the site of the 2010 ASCAP “I Create Music” EXPO and ASCAP Pop Music Awards. Everyone on your team outdid themselves this year, and we were extremely grateful for your help in making our even a tremendous success. Since the hotel brought in Swank Audio Visuals as your new production team, I'd like to take the time to let you know that Swank did an outstanding job in providing us with first-rate, full service production services. From staging to video graphics to live sound, we need to most professional production values possible. No detail was overlooked over the course of our 4-day event and over 2,800 participants. Every last minute addition or change was met with the utmost of professionalism and expediency, all within our budget guidelines. The Swank team's expertise in all technical matters – from a panel utilizing the full capacities of Pro Tools to an awards show featuring some of the top names in the music industry, as well as their overall execution of all the ASCAP's various logistics, gives us full confidence in their abilities to handle anything we need for our future events. Since Swank is relatively new to the Renaissance and was completely new to our show, I wanted to be sure to give you this feedback.